Starring innovative ingredients and a super fruit antioxidant blend, this serum sculpts, lifts and plumps the face for youthful volume and tone. The patented formula has been clinically proven to increase collagen production, thanks to Argassential (high tech argan oil that boosts collagen synthesis) and Neoderyml R (which reactivates aged fibroblasts to improve collagen vitality), alongside protective maqui, acai and goji berries and a host of other technologies blended with fruit extracts. Providing clinical-style results without the downtime, this brand’s bespoke blends are like a ‘skin clinic in a bottle’, combining ultra-advanced actives with soothing botanicals. Offering bespoke ‘couture compounds’ that unite potent, transformative ingredients with soothing botanicals and supportive antioxidants, Skin Design London is one of the most dynamic brands in the skin care arena. Volume - Shape Up is one of the brand’s superstar serums, designed to sculpt, lift and plump the face for youthful volume and tone. Utilising a combination of innovative ingredients, the formula works to redensify skin. Argassential – a high tech argan oil extract – improves fat-building and collagen synthesis to boost skin’s elasticity, Neoderyml R reactivates fibroblasts to improve collagen vitality and Palmitoyl Tripeptide-38 stimulates molecular synthesis to help thicken skin and fill out wrinkles. Alongside these advanced technologies, a richly nourishing blend of super fruit extracts protects skin and supplies countless antioxidants – acai berry, aronia berry, bilberry fruit, goji berry, mangosteen fruit, maqui berry, noni fruit and pomegranate extracts supercharge the patented formula. 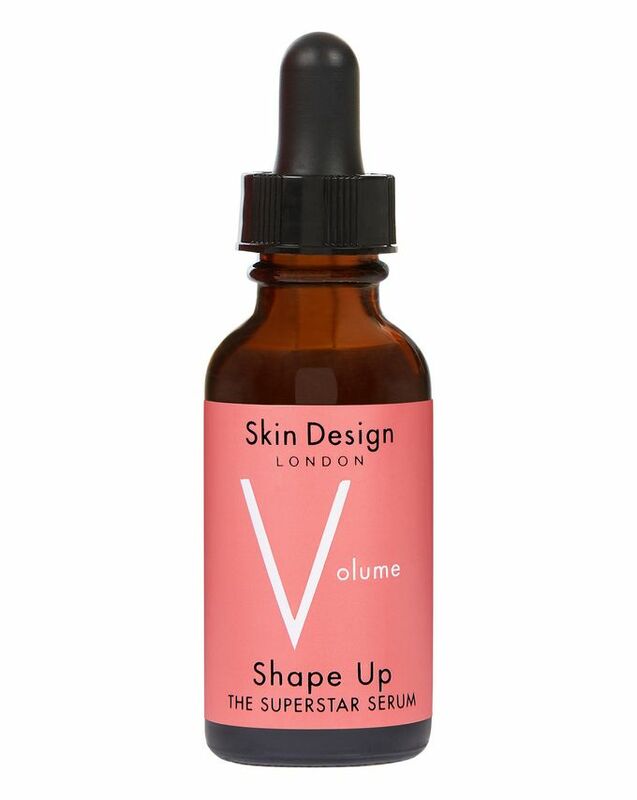 Clinically proven to increase collagen production in aged skin by 6.8% in 11 days, this age-defying miracle is likely to kick-start an addiction to Skin Design London’s unique formulations. Apply 2 to 3 drops directly to clean skin on areas of concern. Follow with moisturiser. Or mix with other serums, moisturiser or foundation to create a bespoke treatment.